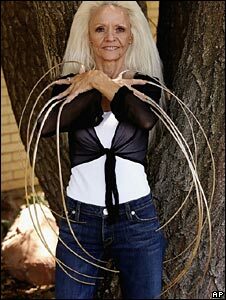 An American woman listed in the Guinness Book of World Records for having the world's longest fingernails has had them broken off in a car crash. Lee Redmond from Salt Lake City, Utah, had not cut her nails since 1979. Their combined length was more than 28ft (8.5m), with the longest nail - on her right thumb - measuring 2ft 11in (89cm), Guinness said. Ms Redmond suffered serious injuries in the crash, but is expected to make a full recovery. A local newspaper, the Deseret News, said she was a passenger in a sports utility vehicle (SUV) at the time of the accident. Her nails were "damaged beyond repair", according to the Guinness World Records website. The organisation said she had been a "fantastic ambassador" for them, and that her nails had been "a fundamental part of her life and unique character".